I keep bouncing back to you! Like a rubber ball, baby, that’s all I am to you… You bounce my heart around…You don’t even put her down.. This FF post was started a couple weeks ago. I didn’t get on last Friday to finish it up for posting because I was busy enjoying my Valentine’s Day gift. Hubby gave me a whole day to myself. I got to go do the grocery shopping alone (and yes, I happen to be one of those really weird people who love grocery shopping! ), I was able to stop for Starbucks coffee, I had fast food lunch that was horrible for me ;-), and then spent the afternoon with my daughter getting pedicures together. It was a wonderful day and so very relaxing. Thank you so much sweetie for knowing what I needed and covering the home place for me!! The man even did homeschool with the kids. Wowsa and wooohoo!!! JJ caught a nasty cold this week. I won’t go TMI on you, but he had a rough week. 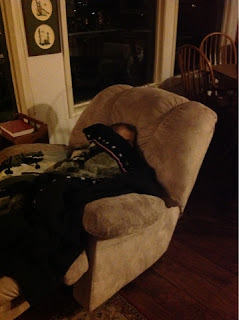 He did get to sleep in a recliner in order to breathe easier. He slept through the insanity that is our breakfast routine Wednesday! The sun is still not up until after 9am here. I would like to draw attention to a few fun series going on right now that you may be unaware of. Another one for my football fans (those of us already going through withdrawal, yet needing the break from our team’s rough year). These are a compilation of the top ten favorite Super Bowl commercials from 2008! Kay, is your header your home??? It is GORGEOUS whether it is or it isn’t yours. What a thoughtful gift! Glad you enjoyed your day. I’m also one of those people who usually enjoy grocery shopping.